Pine Trees: A valuable resource! From the needle, to the bark, to the pollen, to the nut… Pine Trees have so many uses! Pine Needles- more that mulch! Pine Needle Tea has been around for a very long time and offers lots of great health benefits. It is a rich source of Vitamin C and Vitamin A. In the earlier settler days, the Native Americans gave the settlers Pine Needle as a preventative and cure for scurvy caused by lack of vitamin C in the diet. Pine needle tea is especially beneficial for such respiratory problems as colds and congestion. Mainly used to treat coughs and colds, the vitamin C you get from the pine needles is great for every day consumption. A cup of pine needle tea may supply five times as much vitamin C as you would get from one cup of orange juice. According to the Mayo Clinic, recent research indicates that vitamin C may have a wide variety of health benefits including helping to treat urinary tract infections and colds and aiding the absorption of iron. Pine needles are strongly aromatic and even just inhaling the vapors from the tea may break up mucus in the lungs. You can strain the needles out if desire, but I like to chew on mine after I am finished. The tea/needles has a strong citrus taste. You can even add some honey to sweeten it up! Pine Bark- this tree is not only used for building! Both the rough outer bark layer and the main woody part of the tree commonly used as lumber is non-living material. The “inner bark” or “phloem”; the actual living part of the tree is edible. This inner bark carries nutrients from the needles and roots throughout the tree. The most edible and tasty part of the inner bark is that which is closest to the hard woody part of the tree. The portion of the inner bark closest to the wood of the tree has an almost sweet taste. From my love of garbanzo beans spawned my quick addiction to hummus. It has become almost a staple in the house, eating it on a salad, in a sandwich, or as an appetizer. It is so versatile and quick and easy to whip up. Next up in the kitchen came my love for sprouting seeds… so why not combine all my powers, and celebrate my love for two items? I introduce to you, Sprouted Hummus. For more info on sprouting seeds, see our previous post. Sprouting Seeds, an easy way to unlock even more nutritional value! The first step is to sprout your beans. It took a little longer than the seeds normal would take, and I did them a little bit different, using a glass jar and cheese cloth. It is recommended that during the sprouting process, you keep them out of the sunlight. 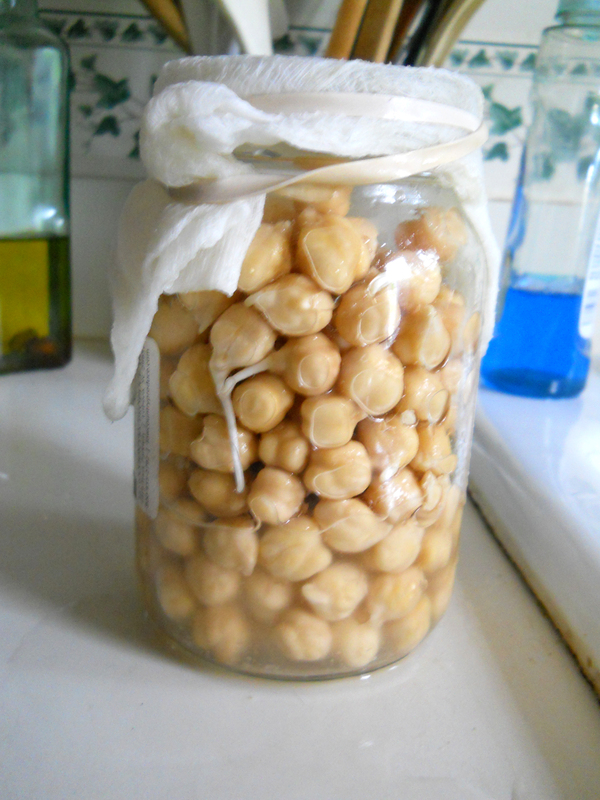 I soaked them for about 10 hours in water, during this time, the chickpeas took in a great deal of water. This causes the bean to think that it is being planted in the ground, and germination begins. Enzymatic inhibitors shut down, and the enzymes present in the garbanzo bean turn proteins into amino acids (garbanzo beans contain all 8 essential amino acids! ), complex carbohydrates are broken down into simpler, more digestible starches and natural sugars, and nutrients like vitamins B, C, and E are produced in great numbers. A few tbs olive oil, i think more is better! When your sprouts are about 1-2 cm long they are ready! In a food processor combine your garbanzo beans, garlic, and a pinch of salt. Next add the rest of the ingredients and pulse until evenly combined. For a creamier hummus, add more olive oil or water until its your desired consistency. Sprouted garbanzo beans are an excellent source of protein, and their delicious, nutty — almost grassy — flavor helps to make this raw hummus a real crowd pleaser. Experiment with other flavors, like red pepper or sun dried tomatoes! Wheat: You can Sprout your grains, and Mill them too! Are you leery about having a slice of bread, or bowl of pasta? With all the hype of the role of gains in weight gain, it is easy to see why. However, there is a lot we need to understand before ditching those dinner treats. In order to bake your bread and eat it too, we must understanding the difference between whole grain and refined grain is a good starting point. The truth is, the grains that make up the typical American diet are highly refined. Many people think that whole wheat is a much “heavier” grain and contains more crabs, therefore turning to the “refined” grains. This is where grains get their bad wrap. Health problems such as Obesity, Diabetes, Hypoglycemia, Heart Disease, Bowel Cancer and Tooth Decay are just some of the major diseases on the rise since the introduction of white flour in the 1900’s. Many nutritionists agree that white flour and other refined foods are largely responsible. Refined, processed grains are stripped of most of their nutrients, as the bran and the germ are removed. This is done in order to be able to preserve the grain for longer. When commercially making white flour, over half of the vitamins B1, B2, B3, E, folic acid, calcium phosphorus, zinc, copper, iron, and fiber are lost. Modern milling of whole cereal grains puts the kernel through a high-heat milling process that removes the germ and bran (which contain 90 percent of the nutritional content of the kernel), leaving only the endosperm (starch). The result is “refined” flour. Although this results in an easier flour for cooking, it strips it of all the good stuff. So you’re basically eating gluten and starch when you eat products off the shelf. For PR purposes, you’ll see breads and cereals claiming to be “enriched with vitamins and minerals!” Meaning that some of the nutrients such as niacin, riboflavin, thiamin, and iron, are added back. However, Usually only 2-4 of the missing vitamins and minerals can be replaced and enrichment does not restore insoluble fiber and other nutrients that are lost during the milling process. Whole grains contain the bran, the endosperm, and the germ. Because they have not gone through the refining process, they are good sources of fiber, B vitamins, iron, zinc, magnesium, vitamin E, and selenium. They also contain the plant chemicals called phytochemicals, which are believed to have many health-promoting effects. Now that we have determined the difference in refined and whole grains, we can take it a step further with sprouted grains! Sprouted grains, unlike processed grains, are extremely nutritious and provide a valuable part of any healthy diet. Sprouted grain differs from whole grain in three fundamental aspects: 1) sprouting activates food enzymes; 2) sprouting increases vitamin content, and 3) sprouting neutralizes antinutrients like phytic acid which bind up minerals preventing your ability to fully absorb them. Sprouted wheat is highly nutritious and surprisingly sweet. It is much easier for the body to digest since much of the starch is changed into vegetable sugars. They are also low GI, so they are digested more slowly by the body, keeping the blood sugar levels stable for longer, making people feel more satisfied. (Leading to less snacking) It is interesting to note that the more highly processed a food is, the higher GI it is. A loaf of white bread is significantly higher GI than a loaf of sprouted grain bread. If you are like me, I had only heard of the words Glycemic Index and thought it only related to diabetics. The fact of the matter is, it relates to everyone. The glycemic index or GI describes this difference by ranking carbohydrates according to their effect on our blood glucose levels. Choosing low GI carbs – the ones that produce only small fluctuations in our blood glucose and insulin levels – is the secret to long-term health reducing your risk of heart disease and diabetes and is the key to sustainable weight loss. You can Sprout your grains, and Mill them too! Take your health into your own hands. The more we rely on grocery store shelf products, the more fat we add to our diets. Once we slow down and get the facts, we can start replenishing our body of all the good stuff it’s missing. Even if milling and sprouting are not up your alley, know what you put into your body. Read the labels of the stuff you are buying. Dandelions… Common yard weed or valuable herb? You have heard the expression “You are what you eat” and in this case, I wouldn’t mind it. Who doesnt love a beautiful yellow flower? The Dandelion, also thought of as the common yard weed, is a valuable herb with many culinary and medicinal uses. Dandelion is a rich source of vitamins A, B complex, C, and D, as well as minerals such as iron, potassium, and zinc. 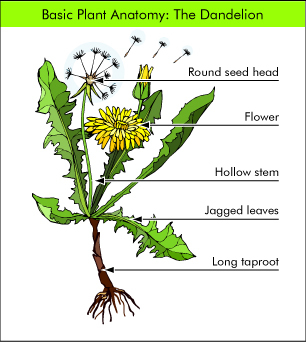 The Dandelion plant is a Beneficial Weed for your garden. Cullanary Uses: Salad from my yard! Every part of the dandelion plant is edible, from the flower to the root! Dandelion greens are wonderful in salads, sauteed or steamed. They taste like chicory and endive, with an intense heartiness overlying a bitter tinge. Collect dandelion leaves in early spring, when they’re the tastiest, before the flowers appear. Harvest again in late fall. If you harvest year around, blanch to remove bitterness and make leaves more palatable. The leaves are higher in beta-carotene than carrots and have more iron and calcium than spinach. You can also eat dandelion flowers, or use them to make wine. Collect them in a sunny meadow, just before mid-spring, when the most flowers bloom. Some continue to flower right into the fall. Use only the flowerís yellow parts. The green sepals at the flowerís base are bitter. The flowers add color, texture, and an unusual bittersweet flavor to salads. You can also sautÈ them, dip them in batter and fry them into fritters, or steam them with other vegetables. They have a meaty texture that contrasts with other lighter vegetables in a stir-fry dish or a casserole. The taproot is edible all year, but is best from late fall to early spring. Use it as a cooked vegetable, especially in soups. Pre-boiling and changing the water, or long, slow simmering mellows this root. Sweet vegetables best complement dandelion roots. Sauteing the roots in olive oil also improves them, creating a robust flavor. The Dandelion plant provides you with many vitamins: B-1, B-2, B-5, B-6, B-12, C, E, P, and D, biotin, inositol, potassium, phosphorus, magnesium, and zinc. Dandelion may be used for a wide range of conditions requiring mild diuretic treatment, such as poor digestion, liver disorders, and high blood pressure. Dandelion root is one of the safest and most popular herbal remedies. The decoction is a traditional tonic. Using this will strengthen the entire body, especially the liver and gallbladder. It helps promote the flow of bile, reduces inflammation of the bile duct, and helps get rid of gall stones. It’s good for chronic hepatitis, it reduces liver swelling and jaundice, and it helps indigestion caused by insufficient bile. The root and leaf tea act on the kidneys as a gentle diuretic, increasing urine production by promoting the excretion of salts and water from the kidney and improving the way they cleanse the blood and recycle nutrients. The root‘s inulin is a sugar that doesn’t bring out the rapid production of insulin, as refined sugars do. It helps mature-onset diabetes, by normalize blood sugar levels and improve lipid profiles. The root is also believed to have mild laxative effects and is often used to improve digestion. Research suggests that dandelion root may improve the health and function of natural bacteria in the gastrointestinal tract. Studies have also reported that dandelion root may help improve liver and gallbladder function. Dandelion leaf infusion also good a good accompaniment to your evenings. All the digestive glands and organs respond to this herb’s stimulation and encourage the production of proper levels of hydrochloric acid and digestive enzymes. Even after the plant gets bitter, a strong infusion, is rich in vitamins and minerals, and helps people who are run-down. There are no poisonous look-alikes, however, some may develop an allergic reaction when in contact with the Dandelion. If you have an allergy to ragweed, chrysanthemums, marigold, chamomile, yarrow, daisies, or iodine, you should avoid dandelion. Dandelion coffee aka dandelion tea, is an infusion or herbal tea, and coffee substitute, made from the root of the dandelion plant. It is an excellent caffeine free coffee substitute that tastes very similar to regular coffee known to be high in anti-oxidants. Harvest the Dandelion: Cut the roots off the bunch with a knife. (If you choose bunches with lots of dandelion greens, you’ll be sure to get larger, better quality roots.) Save the leaves to use in cooked dishes and dandelion salad recipes, or for making dandelion wine. Prepare the Root: Start by cutting the roots into chunks and soaking batches of them in water repeatedly until the water runs clear when drained. Place the root pieces into a food processor and grind them up to resemble coarse meal. Coffee Time: When they’ve cooled a bit after roasting, grind the dandelion roots in a coffee grinder or food processor to the texture of regular coffee for use in your automatic coffee maker. Blend all ingredients in food processor until thoroughly mixed. Serve like you would any pesto, with crackers, veggies, etc. Rinse off flowers and trim excess stems. Place honey and flowers in a jar and mix thoroughly. Let the flowers soak up honey for three or more days. Use as jam. Spread on bread, crackers, etc. Quantities depend on how many flowers you gather and prepare. Gather as many dandelion flowers as you’ll have the courage to prepare, at least 100 flowers. The exact quantity is not important as you will adjust the quantity of water anyway. The syrup can be prepared in various ways, the idea being to infuse water with the flowers and to add enough sugar for the syrup to be sterile but still soluble. Washing & Preparing: Start by washing the flowers and cut their base to help detach the yellow petals from the green leaves. We only use the petals. You can also do this entirely by hand but the knife speeds it up. Infuse: In a saucepan, cover the dandelion petals with water. Mix well until all petals are covered. Bring to a boil, cover and let infuse in the fridge overnight. Filter: Pour the mixture through a fine sieve and press with a spoon to extract all juice from the boiled petals. Add a little lemon juice to the taste. Mix & Store: Mix well and heat slowly until all sugar is dissolved. Filter again and store in a bottle. Some people use more sugar, add a little pectin and cook it a bit longer to turn this syrup into a Dandelion flower jam. Blend in blender until smooth! Enjoy! Mix together the egg and milk, adding the flour to create the batter. Dredge each dandelion flower in the batter Drop each one, flower side down, into a skillet with oil and fry. When they’ve lightly browned, flip them over and brown them on the other side. For a sweet treat, drizzle them with maple syrup, honey, jam, or powdered sugar. For savory fritters try dipping in mustard or adding some savory herbs to the batter. One way to kill the bitterness is to blend them with fruit in a green smoothie. The other way is to process them with some sort of fat, i.e. nuts, oils, and avocados. Although edible all season, picking dandelion leaves in the early spring or late fall (after the first frost) will get you greens that are less bitter. After reading the book Green for Life I have become addicted to Green Smoothies! The book is worth the buy, and defiantly worth the read. It has a lot of very interesting information, and great green smoothie recipes as well! There are a lot of variations you can add or do to your smoothies, but the base the recipe would be a 40/60 ratio with your fruits and greens (40% greens, 60% fruit) Feel free to get creative! Its a great way to use your greens, and healthy breakfast! Bake for 10- 15 mins, or until they are crispy. Wait for them to turn to a dark green- but be careful not to overcook. I will turn them over half with through baking so they cook on both sides evenly. In a mixing bowl, mix flour, baking soda, baking powder, salt, and spices. In another bowl, mix honey, egg, yogurt, oil, vanilla, apples, kale, dried fruit and nuts. Add wet ingredients to dry ingredients, stirring just till moistened. Fill 12 typical size greased muffin cups 2/3 full. Made 12 very full muffins. And delicious for breakfast, as a snack, or even as a healthy dessert!